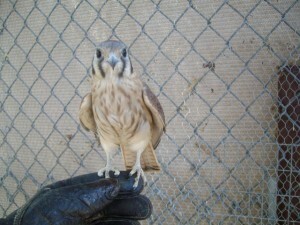 We are in the process of organizing and promoting the 2013 Raptor Handling Class. This will be the 10th year of presenting this class that was was conceived to raise the bar for anyone working with raptors in education programs. Over the years we have collected some wonderful comments from our attendees with our end-of-class survey. 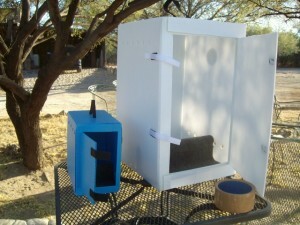 However, just a few days ago I received the following in an email from Joan Cass who came to the 2012 class from the Tucson Wildlife Center in Tucson, AZ. Over the weeks and months I slowly introduced out little Kiki to the world, and now she is happy to attend whatever gathering we ask her to. She is used to dogs, generators, running children, and umbrellas. When the breeze comes up she opens her wings (I call it glove surfing) and shows off her lovely tail. Only once she worried us by ducking and scanning the area. We noticed two Harris’ hawks circling far above us. She had seen the shadow from under the pop-up tent. Thanks for providing this course and giving me the credibility and the confidence to move ahead with her training! This is exactly why I present this class and this note from Joan is great reinforcement. Please visit this link for information about the 2013 class and raise the bar for the birds in your collection. This entry was posted on Wednesday, May 1st, 2013 at 5:57 pm and is filed under Behavior Science, Class, raptors, RHC, Sid Price, Training, Workshop. You can follow any responses to this entry through the RSS 2.0 feed. Responses are currently closed, but you can trackback from your own site.